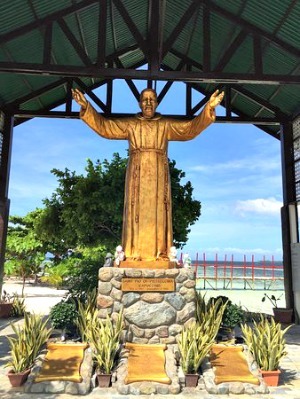 This obscure islet is fast becoming one of the top tourists attractions in Bohol after its owner-philanthropist built a chapel dedicated to St. Padre Pio of Pietrelcina, after he was cured of his right blind eye through the intercession of the famous saint. In an interview with this writer during a tour of this beautiful islet off Panglao Island, Ramon E. Rodriguez, a philanthropist-businessman, said he was blind in his right eye after a vein erupted following a high blood pressure of 220/110. For over a decade, he underwent medical treatment by an ophthalmologist, giving the most advanced medicine with steroid but with no effect. Rodriguez related his grandiose life as a businessman and how he got involved as a devotee of St. Padre Pio of Pietrelcina after turning away from God for many years. “I virtually forgot about God,” Rodriguez said with remorse in his face. “Then I got sick with high blood pressure. I went to my doctor, who prescribed me a medicine called Predzion Steriod which I took for many years, but still my right eye was still blind,” Rodriguez said. “One day, my close friend Jesus Mendoza gave me a novena prayer of St. Padre Pio,” he said. “I took it and casually put the novena prayer to my pocket. But my friend told me to give due respect to the novena prayer by treating it with some degree of reverence,” Rodriguez said. “He reminded me about Jesus Christ our Lord God and Saviour." "You have forgotten Him,” Rodriguez quoted his friend as saying. Rodriguez then got the novena prayer from his pocket and put it back gently in his pocket. Before he knew it he started praying to St. Padre Pio. “However, during the prayer, I told St. Padre Pio to cure me in 30 days and if granted my petition, I promise to honor you the rest of my life,” Rodriguez said. “After three weeks of constant prayer my right eye was still blind,” he added. “I reminded again St. Padre Pio that 30-day is fast approaching and I swore to fulfill my promise if cured within that period,” Rodriguez said. “However, on the 26th day of my novena, I was shocked when I woke up that morning when my right eye could see,” he said. “Still I could not believe. I covered my left eye and I saw everything with my right eye. I saw my wife Didi on my side still sleeping,” Rodriguez recalled with joy. To further manifest his right eye could see, he went to the Cardinal Santos Medical Center in Greenhills, San Juan, Metro Manila where his family resides to see his doctor. Getting there at 7:00 in the morning, the hospital staff was surprised to see him too early since the doctors’ clinic opens at 9:00 a.m.
Rodriguez said he proceeded to the canteen to take his breakfast. “Before taking my breakfast, I again covered my left eye to check if my right eye could see. I was overjoyed when I saw everything with my right eye!” Rodriguez said. “When I went to see my doctor telling him my right eye could now see, he told me that the medicine he gave me was effective. I did not tell him initially about St. Padre Pio’s intercession that healed me,” he said. From the hospital, Rodriguez went to the church also in Greenhills where he saw Fr. Guido, the parish priest. He asked him where the statue of St. Pio is. He was told there was none but was instructed to proceed to St. Francis Church along Shaw Boulevard in Pasig City. “While I was making the sign of the cross at St. Francis Church before the image of St. Padre Pio, I felt some hands pressing my shoulders telling me that from now on you pray to Me (Jesus Christ) who answered your prayers,” Rodriguez vividly recalled on what transpired that day in his life. “I knelt and fervently prayed to God our Lord Jesus Christ and thanked Him for healing me through the intercession of St. Padre Pio,” he said. With answered prayers, Rodriguez as promised constructed a chapel on the islet popularly known as Isola di San Francesco off the island of Panglao, Bohol. Fronting the chapel is a towering 20-foot replica of St. Padre Pio of Pietrelcina, who during his lifetime suffered the agonizing bleeding wounds of Christ for 50 years before he died at the age of 85 in 1968. Today, May 25, marks the 130th birth anniversary of St. Padre Pio. The Isola di San Francesco Island is just a 10-minute pumpboat ride. Today, thousands of local and foreign tourists visit the islet which is fast becoming one of the major tourist attractions in Bohol. Most of the visitors go to the islet to pray but some go swimming and snorkeling in the unpolluted sea water around the area. What is more, going there is free except for a donation of any amount. For Mr. Rodriguez, it was a fulfillment of a promise he made after his blind eye was healed by God’s grace through the intercession of St. Padre Pio of Pietrelcina. Buying the island, together with wife Didi Cloribel, more than 50 years ago, the islet was tranquil all these years until the chapel was built three years ago.